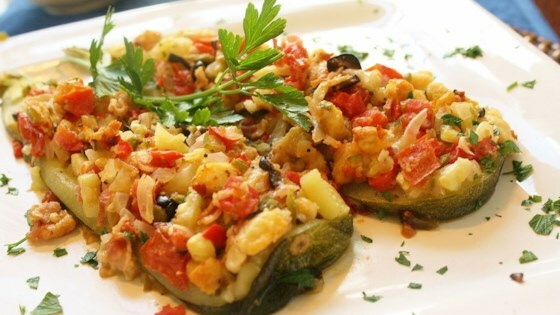 "Delish zucchini stuffed with your favorite ingredients and finished on the hot grill. Great side dish or as a light meal on their own." Place the zucchini in a pot with enough water to cover. Bring to a boil, and cook 5 minutes. Drain, cool, and cut in half lengthwise. Scoop out the pulp to about 1/4 inch from the skin. Chop pulp. In a bowl, mix the zucchini pulp, bread pieces, bacon bits, olives, jalapeno, green chile peppers, onion, tomato, and Cheddar cheese. Season with basil, seasoned salt, and pepper. Stuff the zucchini halves with the pulp mixture. Seal each stuffed half in aluminum foil. Place foil packets on the prepared grill over indirect heat. Cook 15 to 20 minutes, until tender. Zucchini are stuffed with sausage and topped with tomato sauce and melty cheese. Neither of us cared for this at all. Lots of prep work with a lot of ingredients. Maybe that's the problem - there's just too much going on. Just too fussy, too mushy, and an unusual flavor. I've made these before and they are great. We use sweet Italian sausage instead of bacon and they are a big hit.